Next up is a treat worthy of it’s title. This cake requires very few ingredients yet, of course, stars my favorite one. In fact, I never would have thought that just these ingredients would make a cake but according to Amber and her recipe from Almost Vegan, it does. This is a dense and rich cake full of whole-grain goodness and as a bonus, happens to be vegan. I imagine this is very similar to a dense Banana Bread minus the bananas and would make an outstanding breakfast to-go. I plan to make and share a maple version of this recipe shortly. 1. Preheat the oven to 350 degrees. Combine the flour, baking powder, sugar, and salt in a large mixing bowl. Combine the applesauce, soymilk, peanut butter, and oil in another bowl and whisk together until smooth. Pour the wet ingredients in with the dry and stir together until fairly well blended, then whisk until the mixture is smooth. Stir in the chocolate chips and all but a tablespoon of the peanuts. Pour into a greased 9-inch round (or square) cake pan. Bake for 20-25 minutes until golden and a knife inserted in the center comes out with chocolate, but no batter. 2. Chocolate Glaze (optional): Use about 1/2 cup powdered sugar, 3T cocoa powder, and just enough milk to make it smooth (add it 1 tsp at a time). 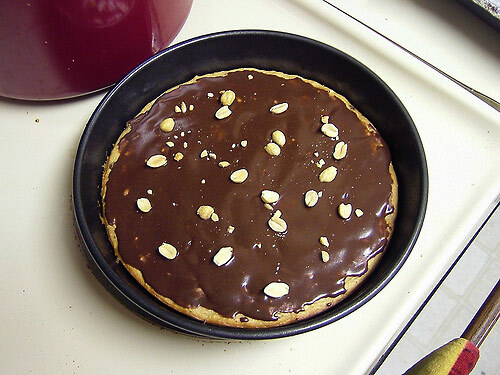 Spread the glaze over the warm cake, sprinkle with the remaining peanuts, and set aside to cool. Original recipe by Amber at Almost Vegan. YUM! Did you prefer it with or without the glaze? And is it a noticeable peanut butter flavour or is it more subtle? I’m looking forward to making this! Yay! I’m so happy to see you posted about this! I can’t wait to see your maple syrup-sweetened version. I can’t wait for this weekend so I can make it! I have a few other ideas up my sleeve. I’m going to change a few things around but keep the same basic premise…You’ll be the first to know! With 1/2 cup peanut butter, this one does look a lot more promising. I’ll investigate further this weekend. And it seems that since this recipe doesn’t rely on eggs or any other “baking actions”, I would think any flour (maybe almond meal?) would work fine. Groan. And. Moan. I think I need to go take a cold shower. Hahaha, but your cake will get ruined in there! Nice recipe Nick. Are you and Almond butter fan? I’m liking it more and more and just found a new Dark Chocolate almond butter flavor. Haven’t tried it yet, but I’m looking forward to it! I could eat the entire cake in one fell swoop! I will be making this one sometime soon for sure! Definitely trying this sometime soon!